There are many things that are stopping girls from being able to get an education, from lack of infrastructure to natural disasters. However, there is one large, looming obstacle that is keeping many girls from schools; child brides. It is estimated that in the next decade 14.2 million girls will be married before their 18th birthday. Should this figure end up being true, it will result in 14.2 million girls who will be pulled from school; 14.2 million girls who will not receive skills to help the prosperity of their country. As I have mentioned in past pieces, removing young girls from their education has a negative effect on the girls, their families, and on their countries as a whole. When girls are married at such young ages they are generally pulled from school and often get pregnant quickly meaning that their chances of returning to school are slim-to-none. One country where Child Brides are a large phenomenon is Ethopia. According to UNICEF, 49% of girls in Ethiopia are married by age 18, with 24% of them being married before age 15. There are many pieces written online about what people have witnessed regarding Child Brides in Ethiopia. Many of them explain that most of these girls want to return to school. For the girls it is not just a chance to get an education, which they do value, but it is also the chance to make friends and to gain experiences besides those they make within the home. In one account of a child bride in Ethiopia, Enana, a seventeen-year-old with a four year old son, talks about her experience as a child bride. She relates how she felt betrayed by her parents, and how she didn’t even know how old she was at the time. By doing the math, she was at oldest thirteen if she is around seventeen and already has a four year old child. One of the quotes she relays is “I didn’t even know how to clean myself,” yet here she was, being sent off to take care of others and raise her own family. This also means that Enana was just one of the many girls who experience their first sexual encounter at age 13. In her account, Enana talks about how frightened she was but how her parents punished her and sent her back to her husband. Unfortunately, this is a not an uncommon situation in Ethiopia, however, there are many non-governmental organizations (NGO) popping up to help these girls deal with the unfortunate situations they are put in. One of these is TESFA – which means “hope” in the Amharic, the native language. Funded by Nike, TESFA works with over 5000 child brides in Ethiopia. The primary purpose of TESFA’s work is to provide child brides with crucial parts of education that they missed due to their marriage at such a young age. 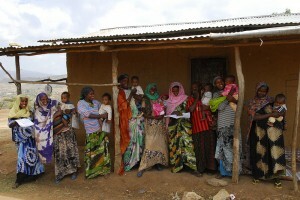 TESFA focuses heavily on reproductive health as well economic education – such as how to help save money. However, to me, this is only a temporary result. While it is a wonderful resource to those who have already been married, it is not working to further halt child marriage, only to aid those who have already been placed into marriage. A study by the International Center for Research on Women (ICRW) found that there are only 23 organizations currently working to help with the issue of child marriage around the world, and that of these, only five of them had the primary goal of ending child marriage. This means that the other organizations are simply trying to aid those already in the situation – much like TESFA, or are including child marriage as a smaller part of a large organizations. One organization that continually comes up while research this topic is Girls Not Brides. 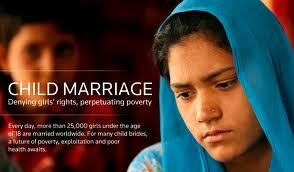 They are a comprised of many NGOs working to help eradicate child marriage around the world. Currently they have representatives from over forty countries and are funded by many large organizations, once again including the Nike Foundation. So what can you do? You can donate money to one of several Catapult campaigns to help empower girls and end child marriage. You can also share the facts on twitter and get involved. Much of the movement to end child marriage has come from grassroots campaigns, and there are many opportunities to get involved from online campaigning to hosting movie events. The movement has already started to grow, and the more attention it is given and the more that other people help spread the word, the more it will continue to grow. I encourage you all to read more about TESFA and about Girls Not Brides in the links that were provided and get involved in the online conversation. Zoe is an undergraduate student in her final year of International Studies at Portland State University. Her regional focus is on Europe, and she has taken many classes focusing on community development and understanding the world from an international perspective. Zoe is also an active member in the National Association for College and University Residence Halls (NACURH Inc.). She serves as a director to the National Residence Hall Honorary (NRHH) chapter at her university, and she also sits on her regional board as well as the international board as a finance officer. This summer she will be embarking on her first international trip to Europe where she will be studying food sustainability. As an ISC intern her research will focus on Women’s education issues, Human rights in Eastern Europe and Sustainable international development.